This study concerns the analysis of four painted wooden panels from the second half of the 15th century which embellish the ceiling of a palace situated in Cremona (Northern Italy). This type of painting was generally used to decorate the top of the walls and the ceilings of the rooms in aristocratic palaces and they usually portray the owner’s ancestors, family members or important visitors. The paintings are of historical importance since they enable us to study the clothing and hair styles which were in fashionable in Italy during the Renaissance. These panels were heavily damaged and required a lot of restoration including the cleaning of the paint layers. This enabled us to carry out a thorough examination of the materials and techniques used for creating these paintings. Various micro-samples were taken in order to distinguish the materials and, in particular: (i) to analyze the ground layer and study its function; (ii) to typify the organic binders and the pigments of the polychrome films. 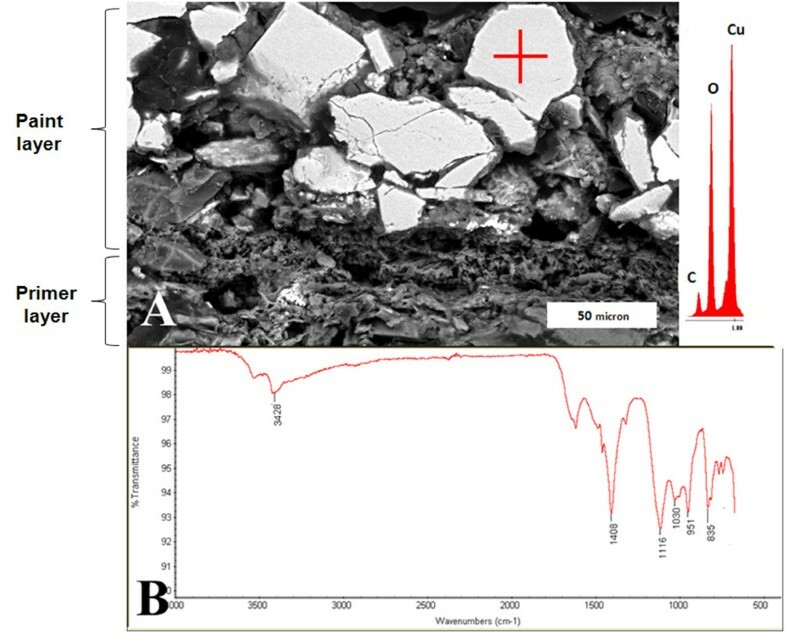 The stratigraphic sequence of micro-samples was analyzed using optical microscopy, the elemental composition was determined by means of the SEM-EDX technique while the organic binders were analyzed by means of μFT-IR spectroscopy. The main component of ground layer proved to be clay. The organic binder was probably composed of a protein-based material such as animal glue. This type of ground layer is similar to the traditional 15th century Flemish formula and seems to confirm the strong influence of that artistic technique in Northern Italy. Cross-section investigation showed a primer layer over the ground layer made of white lead pigment. In fact, a white primer was used to cover the ground layer of yellowish clay common in Central Europe. The importance of this research is also confirmed by the study of paint films, for which pigments such as azurite or cinnabar were used. Red lake pigment for painting the subjects’ complexions was emphasized. The analyses provide new detailed information concerning the materials used for painting the ceiling panels, the layer sequence of the paints and Northern Italian 15th century painting techniques. Aesthetic sensibility for interior furniture was of great importance from the 15th century onwards and structural elements such as walls and ceilings were also decorated in order to embellish the interior of buildings. Wooden ceilings represented an important and widespread art form in Italy . Skilled craftsmen operating in several notable “ateliers”, mainly located in northern Italy, decorated ceiling panels with subjects inspired by the artworks of famous painters, for instance Andrea Mantegna, Vincenzo Foppa or Giovan Pietro da Cemmo. Painted wooden panels were mainly produced to enhance the ceilings of aristocratic homes and churches . Today these panels represent an important source of information about 15th and 16th century customs and traditions as the subjects of the decorations were typical of the Renaissance . At that time, the wooden ceilings had a typical structure with central beams and lateral rafters with the presence of a console along the vertical faces. The surfaces of the beams were painted and decorated and small wooden panels were hung between the beams and the console . These artworks were given a ground layer which provided the base for painting. Although a lot of these paintings have been lost over the centuries, some of them can still be found in Italian museums or in the original buildings, as for example the painted ceiling panels depicting knights which adorn the ground floor of a building in Vittorio Veneto (Treviso) dating back to 1476, or the palace of Giovanni degli Onesti in Udine . This artistic technique was commonly used in Lombardy and examples of these panels can be seen all over the region. The panels are usually square shaped and depict various subjects such as bust-length portraits of noblewomen or gentlemen, historical, mythological or allegoric episodes, as well as portraits of kings or emperors. Mantova, Brescia, Cremona and Pavia were the most important towns in Lombardy for the development of these decorations . From a technical point of view, Spruce was the main source of wood for the panels due to its ease of workability and soft color. At that time, light-colored wood was commonly treated with pigments, organic dyes, gums, natural resins or oil varnishes in order to give a transparent rosy color to the wood surfaces, conferring to wood a pleasant effect . Moreover, some of the most commonly used pigments for these kinds of paintings were azurite for bleu colors and cinnabar for red, as confirmed by historical sources . The ceiling panels analyzed in this study are part of a group of panels that probably come from a stately home in Cremona which no longer exists and belong to the “Musei Civici” in Cremona. The paintings are portraits of fashionable dames, with rich jewels and fancy headdresses, who were probably the aristocratic owners of the palace. The panels seem to be quite well preserved and no restoration has been documented in the past. Nothing is known about the binders, primer layers and pigments and it is unclear if paintings were made by the same or different workshops and/or artists of the town. A scientific evaluation performed by means of various diagnostic methods is required in order to assess the level of degradation of the painted panels and their materials. Moreover, the analyses of the paintings’ components may provide useful information about the painting techniques . The analyses performed on micro-samples taken from characteristic points of different pattern colors enabled us to study the stratigraphy of the ground layer and paint layers. The samples were studied with an optical microscope, μFT-IR micro-spectroscopy and Scanning Electron Microscopy with EDX spectrometer (SEM-EDX). The characterization of these materials represents a first step in determining the artistic techniques used to make these particular kinds of artworks during the Italian Renaissance period. Four micro-samples were taken from different points of the four panels (Figure 1). The samplings were carried out by using a biopsy needle in order to gather micro-samples measuring less than one millimeter in diameter. Sample T2 came from a panel with the portrait of a woman and was taken from the complexion color of her face; T3 sample was taken from the red color of a woman’s headdress of a second panel; sample T4 comes from the edge of a third panel where the primer layer was visible. The last T5 sample comes from the green background of a fourth panel that depicts another woman’s portrait. A summary of the characteristics of the samples and the analyses performed is reported in Table 1. Sampling points on the celing panels. T2, complexion color; T3, red color; T4, ground layer; T5, green dark color. Fourier Transform Infrared (μFT-IR) micro-spectroscopy analyses were performed with a Nicolet iN10 Thermo Fischer μFT-IR spectroscope, in Attenuated Total Reflectance (ATR) mode with germanium crystal and in reflection-absorption mode on gold foil following the treatment of some micro-fragments with H2O used as solvent to solubilize the binding media from the pigments. The spectral range was 4000-700 cm-1 with a resolution of 4 cm-1. A small amount of various micro-samples was embedded in epoxy resin and cut using a diamond blade. The cross-sections were first abraded with carbon papers (800-500 mesh) and then polished using diamond pastes (6, 3, 1, 0.25 μm). The cross sections were observed under a Leitz Laborlux polarizing microscope (VIS and UV lamps) and then sputtered with an Au coating, using a Cressington 208HR sputter. Scanning Electron Microscopy (SEM) images and energy-dispersive X-ray spectra (EDX) were collected by using a Tescan FE-SEM instrument (MIRA XMU series) equipped with EDAX spectrometer. The microanalyses were performed maintaining the current electron beam at 20 kV, with counts of 100 s per analysis. The semi-quantitative data were obtained by processing the measurements with the EDAX Genesis software. In general the study of the cross sections shows several superimposed paint layers illustrating a complex painting technique. The paintings often contained an intermediate layer between the ground and the paint layers called “imprimitura” (priming layer) which was made of oils and/or resins or proteinaceous binders and fillers. Their function is to ensure adhesion between the paint layers, to protect the underlying paint layer, and, in the case of the imprimitura, to fix the underdrawn and reduce the absorbency of the ground layer . At first the analysis focused on the comparative study of the ground layers of three different panels (samples T3, T4 and T5), in order to analyze their chemical composition. 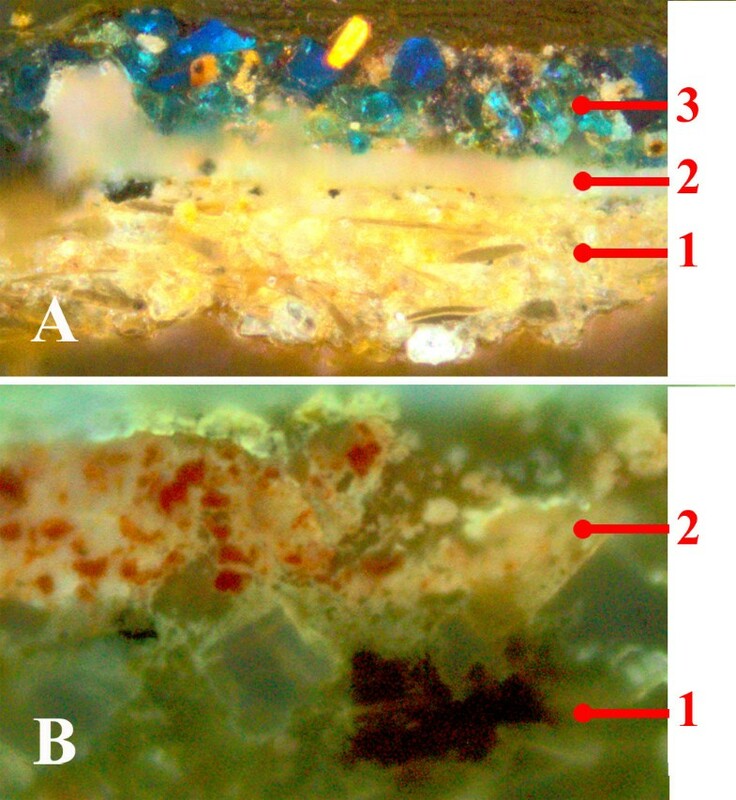 The microscopic examination of samples T3 and T5 that were mounted as cross-sections reveal the presence of at least two layers under the paint film: a thick yellowish ground (Figure 2A, 1), and a thin white layer (Figure 2A, 2). The ground layer of both samples does not appear to be homogeneous and is made of mineral grains which are mainly micrometric in size (less than 2 μm of diameter) and show different colors and shapes. Under UV light the cross-section of the T3 sample shows only one layer under the paint film (Figure 2B, 2), with a diffused brown fluorescence. It is a well known fact that many organic materials become fluorescent after being excited by ultraviolet radiation and, in particular, organic binders can be detected by fluorescence imaging techniques . 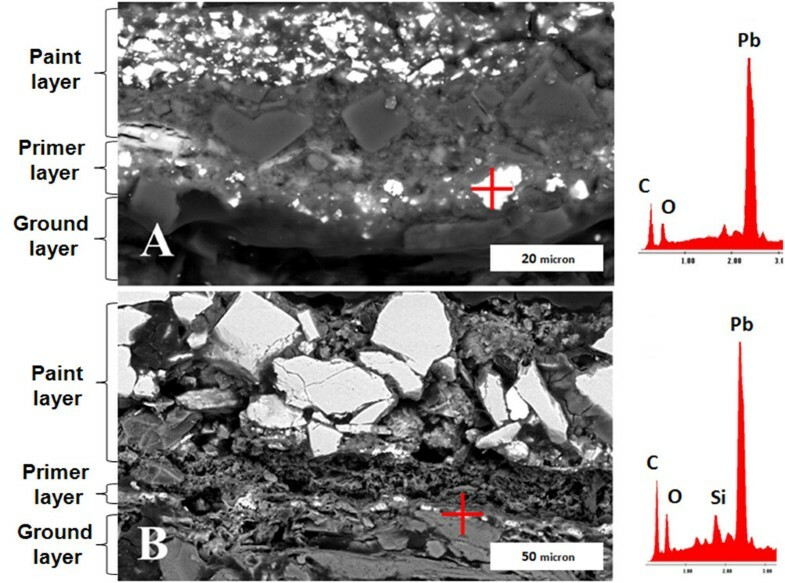 Therefore the brown emission observed in sample T3 could be due to the presence of a proteinaceous material used as binder in the ground layer (Figure 2B, 1). Cross-section optical microscope examination. A) Visible light of the T5 sample from background (fourth panel); layer 1: heterogeneous and thick yellowish ground, composed by mineral grains with different diameter and shape; layer 2: white and thin layer above the ground; layer 3: paint layer with blue pigment minerals. B) UV light of the sample T3 from the red color of the woman headdress (second panel); layer 1: a brown fluorescence widespread along the ground layer; layer 2: paint layer with the inorganic red minerals and a white binder without fluorescence effect. The EDX analyses performed on different areas of the ground layer show emission peaks of K, Si, Al, O that could be due to the presence of K-feldspar minerals (Figure 3A). The relative amounts of Al, Si, Mg, K, Ca, and the high emission of Fe, probably related to an iron hydroxide and/or oxide pigment such as hematite, suggests the presence of a natural clay as main component . The low intensity of the S peak, if compared to the Ca, suggests that calcium sulphates (gypsum, CaSO4·2H2O) are only present in small amounts. It should be noted that traces of gypsum are naturally present in clays. Analytical characterization of ground layer. A) EDX spectrum of T5 ground layers; B) μFT-IR spectrum of T4 ground layer sample. Further information about the composition of the panels ground layer, come from the μFT-IR analysis performed on the T4 sample: the main absorption bands are due to silicates (1029 cm-1), sulphates (1114 cm-1, with a weak shoulder at 1085 cm-1), and carbonates (1406 cm-1). Moreover, the peak at 1650 cm-1 can be due to the N-H stretching absorption which is a characteristic of proteinaceous binders such as animal glue (Figure 3B), possibly used as organic binder of this layer and in accordance with the fluorescent image observed in the UV cross section examination. These compositional results are very important because in Italy it was not a common practice to use clay as the main material of the ground layer. One of the most famous manuals concerning painting techniques and materials is the early renaissance work by Cennino Cennini, first published in 1437, in which all the main formulas were described. Ground layers applied to wood panel surfaces were already very common at that time and they were usually made of gypsum mixed with proteinaceous glue binder (mestica). This ancient recipe was particularly widespread in Italy, because of the bright white color and the low level of shrinkage of the ground layer. The use of a clay-based ground layer in these panels could be due to the influence of Northern European artistic techniques  and it is strictly related to the great increase in trading between northern Europe and Lombardy. Following Gothic times, Flemish artworks reached the most outlying regions and Flemish artists travelled to almost every southern European country, either as students or as workmen, as they were sometimes more skilled than the natives . Clay minerals, at times mixed with chalk grounds, were present in the grey layer that was observed in 14th century Central-European wooden panel paintings and sculptures . The similar composition of the ground layer and relative amounts of the elements observed in the three samples could suggest a univocal origin of the panels. A primer layer was detected on the clay ground layer in samples T3 and T5. SEM images (back-scattered electron, BSE) of the T3 sample show bright white color particles inside indicating the presence of chemical elements with a very high atomic weight. The corresponding EDX analyses performed on the single grains indicate the presence of Pb as the major element of this layer (Figure 4A), with a lower concentration of Carbon and Oxygen. The same compositional data were obtained from the analyses carried out on the primer layer of sample T5 (Figure 4B), even if it appears to be less homogeneous and continuous in this case. The relative amounts of these elements suggest the presence of white pigments such as white lead . White lead [(PbCO3)2·Pb(OH)2)] is the most important of all lead pigments and historically it was the most widely used of all white colors from ancient times to the present day . The use of a lead white primer, sometimes in combination with other white pigments as such as gypsum, was a quite common practice in Northern Europe . The purpose of the white primer was to cover the ground layer with a more homogeneous coating and confer a shiny white color as base for the paint layer at the same time. This was a common practice over a clay ground layer in order to cover the natural yellowish hue of this material and it seems to confirm the influence of the Flemish culture in Northern Italian artistic techniques. Furthermore, the presence of this white lead primer layer in both samples represents further proof of this artistic technique. Cross section SEM image of sample T3 (A) and T5 (B). The punctual EDX analyses performed on primer show in both of cases the same elemental composition, ascribable to the presence of lead white pigment. Firstly, a paint layer analysis was carried out on the red headdress of the second panel in sample T3. Optical microscopic observations indicate that the layer is composed of two superimposed paint layers: the lower orange and the upper red. In order to distinguish the various materials of this stratigraphic sequence, several SEM-EDX experiments were performed. The EDX analyses carried out on the orange layer, showed characteristic emission peaks of Si, Al, K, S with high level of Fe; this elemental composition could be correlated to the widespread presence of K-feldspar and Iron hydroxide and/or oxide, as for example red hematite . The emission peak of Pb was also observed which could be due to the presence of red lead (Pb3O4) (Figure 5). Red hematite was commonly identified as the main red pigment in paintings of the same historical period. It was often associated with small amounts of other red minerals, e.g. cinnabar or minium which did not greatly modify its hue. The addition of red lead to red ochre was a common practice, already mentioned by Pliny . In fact, red-orange and red-purple colors were generally obtained by using different pigments (e.g. cinnabar, red madder, red lead, red ochres earths) sometimes in mixtures. The ochres were also used as colored preparation layers for deeper red paint layers made by cinnabar or minium . EDX analyses of the lower paint layer also show the presence of As and S which could be due to realgar crystals, mineral pigment added by the artist in order to give this layer an orange hue . High emission peaks of Hg and S elements observed by EDX analyses performed on the red upper layer (Figure 5) could be attributed to the pigment cinnabar (HgS). Cinnabar was an expensive but widely used pigment which was frequently mixed with cheaper pigments, usually with red lead . In general, the color of cinnabar ranges from scarlet through brownish red to black and even grey and this variation is mainly caused by the type and amount of impurities. In the past, the adulteration of this expensive pigment with lead tetra oxide or arsenic sulfides, both realgar and orpiment, was a common practice, mainly for its cost rather than artistic reasons . Historically cinnabar was widely used to paint robes and mantles of the various characters and to represent objects and decorative elements in artworks in general. Moreover, cinnabar was used in mixtures with other pigments such as lead white in order to obtain the complexion tones . SEM-EDX analyses on the cross section paint layer of T3 sample. The cross section study, performed by optical microscopy, of the T5 sample from the green background of the fourth panel, enabled us to identify a mixture of green and blue color grains in the paint layer (Figure 2A). The SEM investigation confirmed the presence of a homogeneous layer made of crystals of various sizes, ranging from 5 to 30 μm. EDX analyses performed on the grains showed characteristic peaks of Cu and C (Figure 6A). This result suggests the presence of copper carbonate but it does not exclude other pigments such as e.g. copper oxalates. The μFT-IR measurements, concurrently with other diagnostic techniques, could provide further information about the paint layer pigments  and it may be used to distinguish azurite and malachite minerals by studying the stretching vibration according to their hydroxide group: azurite spectrum only shows one peak at 3426 cm-1, while in malachite spectrum two bands at 3400 and 3320 cm-1 are observed . The μ-FTIR spectrum obtained from T5 sample (Figure 6B) shows a good match with the azurite standard spectrum, as the characteristic absorption peaks of this pigment are observed: 3428 cm-1 (only one peak), 951 and 835 cm-1 (weak peaks) 1408 cm-1 (strong peak) and at 1030 cm-1. Moreover, the IR spectrum showed typical vibration bands of sulphates, centered at 1109 cm-1, as well as the stretching and deformation vibrations of the O-H bond of water at 3525 cm-1 and at 1692 and 1627 cm-1, respectively, which could be attributed to gypsum. Weak bands due to calcium oxalate (CaC2O4·nH2O) were also observed at 1324 and 780 cm-1. Other bands expected for calcium oxalate at 1640–1620 cm-1 could not be clearly assessed due to the gypsum absorptions in the same wavenumber range. Cross section of T5 sample from green background (fourth panel). A) SEM-EDX analysis performed on paint mineral pigment, with the corresponding elemental composition spectrum; B) μFT-IR spectrum performed on paint layer. These results, together with information given by optical microscopy and SEM investigations, seem to confirm the presence of azurite mineral as the main pigment for the paint, although the presence of traces of copper oxalate cannot be ruled out. The green color in the background of the fourth panel could be due to a partial alteration of the azurite pigment . The blue background made of azurite has often been seen to turn into green malachite, e.g. in the blue robe of the Virgin Mary in many oil paintings which have frequently become greenish. As a compositional material, azurite [Cu(CO3)·2 Cu(OH)2] has a relatively rare carbonate of copper base, which is formed chiefly by the action of carbonated waters on other copper minerals in the upper oxidized zone of the deposits . Similarly to azurite, malachite [Cu(CO3)·Cu(OH)2] has a carbonate of copper base and a secondary mineral found in copper deposits, although it is more common than azurite. The main interest in these minerals stems from their use in art works. In fact, azurite may have been employed as a paint pigment as early as the Fourth Dynasty in Egypt and was the most important blue pigment in European painting from the Middle Ages [26, 27]. The last T2 sample was taken with the aim of distinguishing the materials used for the complexion tones. Unlike the previous samples, the cross section examination, by means of optical and electron microscopy, shows the absence of distinct stratigraphic layers. However, the SEM analysis at higher magnification of the sample indicates the presence of widespread inorganic grains over the wood surface (Figure 7). 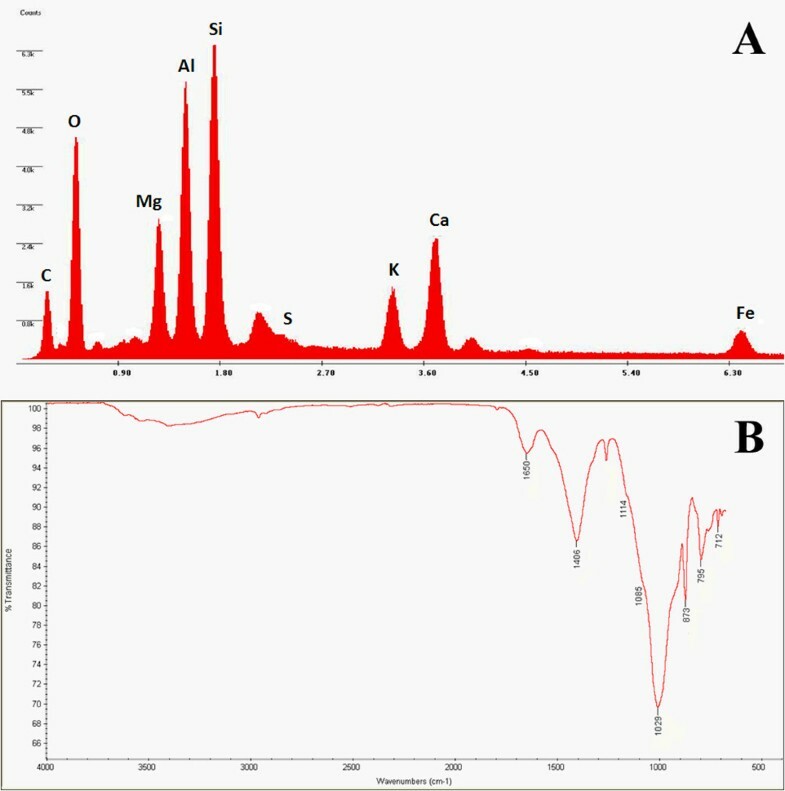 The EDX analysis performed on the single grains indicated the presence of Si and Al, associated with Mg, Ca, K and Fe. A weak emission of S was also detected. The relative concentrations of the elements seem to be related to the presence of aluminum silicate crystals, with traces of calcium sulphates. The presence of these minerals is not directly related to the color of the complexion due to the white color of the grains. This result, together with the evidence of the pink color of the complexion, suggests the use of an organic chromogenic material. Historically, the most important natural red colorants, extensively used long before the 15th century for the complexions of portraits on wood paintings, were red lakes, red colorants often bonded on to a metal salt. The main coloring matters found in these lake pigments are all substituted derivatives of naphtoquinones and anthroquinones . Most red lakes were obtained by extraction of the dyestuff by alkali, with the subsequent addition of alum to precipitate the pigment, yielding a substrate containing Al and O (i.e. amorphous hydrated alumina). The exact nature of the inorganic substrate produced depends on a number of factors including the order of addition of the alum and the alkali during lake preparation. When a substrate was made in this way, examination by μFT-IR could only reveal the presence of Al–O bands. In fact, although the natural dyestuff components could be readily distinguished in the pure state by means of IR spectroscopy, its content is very low in traditional red lake pigments and the IR spectra tend to be dominated by bands deriving from the inorganic substrate. For this reason, the μFT-IR analysis of the inorganic materials could represent an alternative method of lake identification . SEM EDX analysis performed on the grains of the T2 sample from complexion paint. In order to extract and characterize the lake salts present on the surface of the T2 sample, the micro-sample was treated with water and the soluble fractions were analyzed with a μFT-IR in reflection mode (Figure 8). The spectrum showed absorption bands at around 3409 and 1620 cm-1 due to coordinated water, the band associated to vibrations of the Al–O crystal lattice at 948 cm-1, and the peaks expected for sulphates and carbonates at 1114 cm-1 and 1400 cm-1, respectively. This confirmed the presence of inorganic components of the lake pigment, while it did not provide any information about the organic colorant. It should be noted that it is an extremely difficult task to identify such organic colorants due to their very high tinting power and consequently their very small concentration on the painting surfaces . μFT-IR spectrum of T2 sample performed on the soluble fraction after extraction with water. The results of this research provide new information concerning the artistic techniques used on ceiling panels during the Renaissance in Italy. The analyses were performed on micro-samples in order to characterize the pigments of the colored painted films, the composition of the ground layers and to make some hypotheses concerning the nature of the organic binders. The analysis of the stratigraphic sections enabled us to recognize clay minerals mixed with gypsum as ground layer, possibly held together by a proteinaceous material, e.g. animal glue which is an unusual mixture for Italian artistic traditions. This choice is probably due to the strong influence of the Flemish culture in Northern Italy, also for the paint ceiling panels of stately homes, blending artistic techniques and materials. Moreover, μFT-IR and SEM-EDX techniques have enabled us to determine the same ground layer composition of three panels. Results suggest that the artworks share a common origin, i.e. they come from the same palace in Cremona, or that the panels were made by the same artistic workshop. The presence of a thin primer layer made of white lead covering the ground layer confirms the Flemish influence and indicates a high technological standard of making. The study of the layers of the paintings has emphasized the use of high quality and expensive pigments such as cinnabar and azurite, proving the importance of this kind of artwork at that time. Moreover, the presence of a red lake applied directly onto the wood for the complexion tone of a woman’s portrait appears to be very interesting: the artistic aim of this technique was probably related to the transparent effect of the varnish obtained on the panel surface. We would like to thank Dr. Elisabetta Arrighetti and Dr. Roberto Bonomi from the Restoration School of Botticino, Italy, for their cooperation during sampling and results discussion and Dr. Mario Marubbi, Conservator of Musei Civici “Ala Ponzone”, Cremona, Italy, for his valuable advice. All authors contributed to data analyses and to finalizing the manuscript. All authors have read and approved the final version.